Each issue of the C-R-Newsletter features a brief article explaining various aspects of advanced nanotechnology. They are gathered in these archives for your review. If you have comments or questions, please email Jessica Margolin, CRN's Director of Research Communities. In the last science essay, I promised to provide additional detail on several topics that were beyond the scope of that essay. First: How can a mechanosynthetic reaction have nearly 100% yield, say 99.9999999999999%, when most reactions have less than 99% yield? Second: Why will a well-designed molecular machine system not suffer wear? Third: How can contaminant molecules be excluded from a manufacturing system? Mechanically guided reactions are very different, in several important ways, from familiar chemical reactions. Pressure can be two orders of magnitude higher; concentration, seven orders of magnitude higher. The position and orientation of the reactant molecules can be controlled, as well as the direction of forces. Molecular fragments that would be far too reactive to survive long in any other form of chemistry could be mechanically held apart from anything that would react with them, until the desired reaction was lined up. Nanosystems Table 8.1 and Section 8.3 give overviews of the difference between mechanosynthesis and solution phase synthesis. One of the most important differences is that reactions can be guided to the correct site among hundreds of competing sites. An enzyme might have trouble selecting between the atom five in from the edge, and the one six in from the edge, on a nearly homogeneous surface. For a mechanical system, selecting an atom is easy: just tell the design software that you want to move your reactive fragment adjacent to the atom at 2.5 nanometers rather than 2.2 or 2.8. Reactions can be made much more rapid and reliable than in solution-phase chemistry. The reaction rate can be increased dramatically using pressure, concentration, and orientation. Likewise, the equilibrium can be shifted quite far toward the product by means of large energy differences between reactants and product. Differences that would be quite large -- too large for convenience -- in solution chemistry could easily be accommodated in mechanical chemistry. In a macro-scale mechanical system, wear happens when tiny pieces of a component are broken away or displaced. Small concentrations of force or imperfections in the materials cause local failure at a scale too small to be considered breakage. But even microscopic flecks of material contain many billions of atoms. At the nano-scale, the smallest pieces -- the atoms -- are a large fraction of the size of the components. A single atom breaking away or being rearranged would constitute breakage, not wear. This also means that fatigue cannot occur, since fatigue is also a physical rearrangement of the structure of an object, and thus would constitute breakage. We cannot simply dismiss the problem of wear (or fatigue) by giving it another name; if mechanical breakage will happen randomly as a result of normal use, then nanomachines will be less reliable than they need to be. Thus, it is important to consider the mechanisms of random breakage. These include high-energy radiation, mechanical force, high temperature, attack from chemicals, and inherently weak bonds. High-energy radiation, for these purposes, includes any photon or particle with enough energy to disrupt a bond. The lower frequencies of photon, ultraviolet and below, can be shielded with opaque material. Higher energy radiation cannot be fully shielded, since it includes muons from cosmic rays; for many nanomachines, even shielding from more ordinary background radiation will also be impractical. So radiation damage is inescapable, but is not a result of mechanical motion -- it is more analogous to rusting than to wear. And it happens slowly: a cubic micron of nanomachinery only has a few percent chance of being hit per year. The mechanical force applied to moving parts can be controlled by the design of the machine. Although an excess of mechanical force can of course break bonds, most bonds are far stronger than they need to be to maintain their integrity, and modest forces will not accelerate bond breakage enough to worry about. Various chemicals can corrode certain materials. Although pure diamond is rather inert, nanomachines may be made of other, more organic molecules. However, harmful chemicals will be excluded from the working volume of nanosystems. The "grit" effect of molecules getting physically caught between moving interfaces need not be a concern -- that is, if random molecules can actually be excluded. This brings us to the third topic. Extracting product from a hermetically sealed manufacturing system can be done in at least three ways. The first is to build a quantity of product inside a sealed system, then break the seal, destroying the manufacturing system. If the system has an expandable compartment, perhaps using a bellows or unfolding mechanism, then quite a lot of product can be built before the manufacturing system must be destroyed; in particular, manufacturing systems several times as big as the original can be built. The second way to extract product is to incorporate a wall into the product that slides through a closely fitting port in the manufacturing system. Part of the product can be extruded while the remainder of the product and wall are being constructed; in this way, a product bigger than the manufacturing system in every dimension can be constructed. The third way to extrude product, a variant of the second, is to build a bag with a neck that fits into the port. The bag can enclose any size of product, and a second bag can be put into place before the first is removed, freeing its product. With this method, the shape of the product need not be constrained. Any manufacturing system, as well as several other classes of system, will need to take in molecules from the environment. This implies that the molecules will have to be carefully selected to exclude any unwanted types. Nanosystems Section 13.2 discusses architectures for purifying impure feedstocks, suggesting that a staged sorting system using only five stages should be able to decrease the fraction of unwanted molecules by a factor of 1015 or more. Erratum: In the previous essay, I stated that each instruction executed in a modern computer required tens of millions of transistor operations. I'm told by Mike Frank that in a modern CPU, most of the transistors aren't used on any given cycle -- it may be only 105 rather than 107. On the other hand, I don't know how many transistor operations are used in the graphics chip of a modern gaming PC; I suspect it may be substantially more than in the CPU. In any case, downgrading that number doesn't change the argument I was making, which is that computers do quite a lot more than 1015 transistor operations between errors. Engineers occasionally daydream about being able to take some favorite piece of technology, or the knowledge to build it, back in time with them. Some of them even write fiction about it. For this month's essay, I'll daydream about taking a bottomless box of modern computer chips back in time five decades. In 1957, computers were just starting to be built out of transistors. They had some memory, a central processor, and various other circuits for getting data in and out -- much like today's computers, but with many orders of magnitude less capability. Computers were also extremely expensive. Only six years earlier, Prof. Douglas Hartree, a computer expert, had declared that three computers would suffice for England's computing needs, and no one else would need one or even be able to afford it. Hartree added that computers were so difficult to use that only professional mathematicians should be trusted with them. Although I know a fair amount of high-level information about computer architecture, it would be difficult for me to design a useful computer by myself. If I went back to 1957, I'd be asking engineers from that time to do a lot of the design work. Also, whatever materials I took back would have to interface with then-current systems like printers and tape drives. So, rather than trying to take back special-purpose chips, I would choose the most flexible and general-purpose chip I know of. Modern CPUs are actually quite specialized, requiring extremely high-speed interfaces to intricate helper chips, which themselves have complicated interfaces to memory and peripherals. It would be difficult if not impossible to connect such chips to 1957-era hardware. Instead, I would take back a Field Programmable Gate Array (FPGA): a chip containing lots of small reconfigurable circuits called Logic Elements (LEs). FPGAs are designed to be as flexible as possible; they don't have to be run at high speed, their interfaces are highly configurable, and their internal circuits can simulate almost anything -- including a medium-strength CPU. A single FPGA can implement a computer that is reasonably powerful even by modern standards. By 1957 standards, it would be near-miraculous. Not just a CPU, but an entire computer, including vast quantities of "core" memory (hundreds of thousands of bytes, vs. tens of bytes in 1957-era computers), could be put into a single chip. A major part of time-traveling-technology daydreams is the fun the engineer gets to have with reinventing technologies that he knows can be made to work somehow. (It is, of course, much easier to invent things when you know the goal can be achieved -- not just in daydreams, but in real life.) So I won't take back any programs for my FPGAs. I'll hand them over to the engineers of the period, and try to get myself included in their design teams. I would advise them not to get too fancy -- just implement the circuits and architectures they already knew, and they'd have a lightning-fast and stunningly inexpensive computer. After that, they could figure out how to improve the design. But wait -- would they accept the gift? Or would they be skeptical enough to reject it, especially since they had never seen it working? Computer engineers in 1957 would be accustomed to using analog components like resistors and capacitors. An FPGA doesn't contain such components. An engineer might well argue that the FPGA approach was too limited and inefficient, since it might take many LEs to simulate a resistor even approximately. It might not even work at all! Of course, we know today that it works just fine to build a CPU out of thousands of identical digital elements -- and an FPGA has more than enough elements to compensate for the lack of flexibility -- but an engineer accustomed to working with diverse components might be less sanguine. A modern FPGA can make computations in a few billionths of a second. This is faster than the time it takes light to go from one side of an old-style computer room to the other. A 1957 computer engineer, shown the specifications for the FPGA chip and imagining it implemented in room-sized hardware, might well assume that the speed of light prevented the chip from working. Even those who managed to understand the system's theoretical feasibility might have trouble understanding how to use such high performance, or might convince themselves that the performance number couldn't be practically useful. Any computer chip has metal contact points to connect to the circuit that it's part of. A modern FPGA can have hundreds or even thousands of tiny wires or pads -- too small to solder by hand. The hardware to connect to these wires did not exist in 1957; it would have to have been invented. Furthermore, the voltage supply has to be precise within 1/10 of a volt, and the chip may require a very fast clock signal -- fast by 1957 standards, at least -- about the speed of an original IBM PC (from 1981). Finally, an FPGA must be programmed, with thousands or millions of bytes loaded into it each time it is turned on. Satisfying all these practical requirements would require the invention of new hardware, before the chip could be made to run and demonstrate its capabilities. In an FPGA, all the circuits are hidden within one package: "No user-serviceable parts inside." That might make an engineer from 1957 quite nervous. How can you repair it if it breaks? And speaking of reliability, a modern chip can be destroyed by an electrostatic shock too small to feel. Vacuum tubes are not static-sensitive. The extreme sensitivity of the chip would increase its aura of unreliability. Even assuming the FPGA could be interfaced with, and worked as advertised, it would be very difficult to design circuits for. How can you debug it when you can't see what you're doing (the 1957 engineer might ask), when you can't put an oscilloscope on any of the internal components? How can you implement all the different functions a computer requires in a single device? How could you even get started on the design problem? The FPGA has millions of transistors! Surely, programming its circuits would be far more complex than anything that has ever been designed. Rewiring a 1957-era computer required hours or days of work with a soldering iron. An FPGA can be reprogrammed in seconds. An interesting question to daydream about is whether engineers in 1957 could have used the rapid reprogrammability of FPGAs to speed their design cycle. It would have been difficult but not impossible to rig up a system that would allow changing the program quickly. It would certainly have been an unfamiliar way of working, and might have taken a while to catch on. But the bigger question is whether engineers in 1957 would have made the million-dollar investment to gather the hardware and skills in order to make use of FPGAs. Would they have said, "It sounds good in theory, but we're doing well enough with our present technology?" If I went back to 1957 with 2007-era technology, how many years or decades would I have had to wait for sufficient investment? What strategies would I have to use to get people of that era familiar with these ideas? I would probably have to publish theoretical papers on the benefits of designing with massive numbers of transistors. (That's assuming I could find a journal to publish in. One hundred million transistors in a single computer? Ridiculous!) I might have to hold my own conferences, inviting the most forward-thinking scientists. I might have to point out how the hardware of that period could be implemented more easily and cheaply in FPGAs. (And in so doing, I might alienate a lot of the scientists.) In the end, I might go to the media, not to do science but to put ideas in the heads of students... and then I would have to wait for the students to graduate. In short, I probably would have to do what the proponents of molecular manufacturing were doing between 1981 and 2001. And it might have taken just about that long before anyone started paying serious attention to the possibilities. All these reasons for skepticism make sense to the skeptics, and the opinions of skeptics are important in determining the schedule by which new ideas are incorporated into the grand system of technology. It may be the case that molecular manufacturing proposals in the mid-1980's simply could not have hoped to attract serious investment, regardless of how carefully the technical case was presented. An extension of this argument would suggest that molecular manufacturing will only be developed once it is no longer revolutionary. But even if that is the case, technologies that are evolutionary within their field can have revolutionary impacts in other areas. The IBM PC was only an evolutionary step forward from earlier hobby computers, but it revolutionized the relationship between office workers and computers. Without a forward-looking development program, molecular manufacturing may not be developed until other nanotechnologies are capable of building engineered molecular machines -- say, around 2020 or perhaps even 2025. But even at that late date, the simplicity, flexibility, and affordability of molecular manufacturing could be expected to open up revolutionary opportunities in fields from medicine to aerospace. And we expect that, as the possibilities inherent in molecular manufacturing become widely accepted, a targeted development program probably will be started within the next few years, leading to development of basic (but revolutionary) molecular manufacturing not long after. Molecules used to be mysterious things that behaved in weird quantum ways, and it was considered naive to think of them as machines, as molecular manufacturing researchers like to do. But with more sophisticated tools, that one-sided non-mechanistic view seems to be changing. Molecules are now being studied as mechanical and mechanistic systems. Mechanical force is being used to cause chemical reactions. Biomolecules are being studied as machines. Molecular motors are being designed as though they were machines. That's what we'll cover in this essay -- and as a bonus, I'll talk about single-molecule and single-atom covalent deposition via scanning probe. "By harnessing mechanical energy, we can go into molecules and pull on specific bonds to drive desired reactions." This quote does not come from CRN, but from a present-day researcher who has demonstrated a molecular system that does exactly that. The system does not use a scanning probe -- in fact, it uses an innovative fluid-based technique to deliver the force. But the study of molecule-as-machine and its application to mechanical chemistry may herald a conceptual leap forward that will make mechanosynthesis more thinkable. Jeffrey Moore is a William H. and Janet Lycan Professor of Chemistry at the University of Illinois at Urbana-Champaign, and also a researcher at the Frederick Seitz Materials Laboratory on campus and at the school's Beckman Institute for Advanced Science and Technology. A story in Eurekalert describes what he has done. He built a long stringy molecule, put a "mechanophore" in the middle, and tugged on the molecule using the high speeds and forces produced by cavitation. The mechanophore is a mechanically active molecule that "chooses" one of two reactions depending on whether it is stretched. The research is reported in the March 22 issue of Nature. The work demonstrates the new potential of a novel way of directing chemical reactions, but true mechanosynthesis will be even more flexible. The story notes, "The directionally specific nature of mechanical force makes this approach to reaction control fundamentally different from the usual chemical and physical constraints." In other words, by pulling on the mechanophore from a certain direction, you get more control over the reaction. But a mechanophore is self-contained and, at least in the present design, can have one force in only one direction. Mechanosynthesis with a scanning probe (or equivalent system) will be able to apply a sequence of forces and positions. While doing an online search about this story, I stumbled upon the field of inquiry that might have inspired it. It seems that polymer breakage in cavitating fluids has been studied for several years; according to this abstract the polymers tend to break in the middle, and the force applied to various polymer types can be calculated. If this was in fact the inspiration for this experiment, then this research -- though highly relevant to molecular manufacturing -- may have arisen independently of both molecular manufacturing theory and scanning probe chemistry demonstrations. "In molecular biology, biological phenomena used to be studied mainly from functional aspects, but are now studied from mechanistic aspects to solve the mechanisms by using the static structures of molecular machines." This is a quote from a Nanonet interview with Nobuo Shimamoto, who is Professor, Structural Biology Center, National Institute of Genetics, Research Organization of Information and Systems. Prof. Shimamoto studies biomolecules using single-molecule measurements and other emerging technologies. He seems to be saying that back in the old days, when molecules could only be studied in aggregate, function was the focus because it could be determined from bulk effects; however, now that we can look at motions of single molecules, we can start to focus on their mechanical behavior. Prof. Shimamoto studied how RNA polymerase makes RNA strands from DNA -- and also how it sometimes doesn't make a full strand, forming instead a "moribund complex" that appears to be involved in regulating the amount of RNA produced. By fastening a single molecule to a sphere and handling the sphere with optical tweezers, the molecule's motion could be observed. RNA polymerase has been observed working, as well as sliding along a strand of DNA and rotating around it. This is not to say that biology is always simple. One point made in the article is that a biological reaction is not a linear chain of essential steps, but rather a whole web of possibilities, some of which will lead to the ultimate outcome and others that will be involved in regulating that outcome. Studying the mechanics of molecules does not replace studying their function; however, there has been a lot of focus on function to the exclusion of structure, and a more balanced picture will provide new insights and accuracy. I want to mention again the tension between mechanical and quantum models, although the article quoted above does not go into it. Mechanical studies assume that molecular components have a position and at least some structure that can be viewed as transmitting force. In theory, position is uncertain for several reasons, and calculating force is an inadequate analytical tool. In practice, this will be true of some systems, but should not be taken as universal. The classical mechanical approach does not contradict the quantum approach, any more than Newton's laws of motion contradict Einstein's. Newton's laws are an approximation that is useful for a wide variety of applications. Likewise, position, force, and structure will be perfectly adequate and appropriate tools with which to approach many molecular systems. "Looking at supramolecular chemistry from the viewpoint of functions with references to devices of the macroscopic world is indeed a very interesting exercise which introduces novel concepts into Chemistry as a scientific discipline." In other words, even if you're designing with molecules, pretending that you're designing with machine components can lead to some rather creative experiments. This is the conclusion of Alberto Credi and Belén Ferrer [PDF], who have designed several molecular motor systems. Credi and Ferrer define a molecular machine as "an assembly of a discrete number of molecular components (that is, a supramolecular structure) designed to perform mechanical-like movements as a consequence of appropriate external stimuli." The molecules they are using must be fairly floppy, since they consist of chains of single bonds. But they have found it useful to seek inspiration in rigid macroscopic machines such as pistons and cylinders. Continuing the focus on solid and mechanistic systems, the experimenters demonstrated that their piston/cylinder system will work not only when floating in solution, but also when caught in a gel or attached to a surface. Another paper [PDF] reporting on this work makes several very interesting points. The mechanical movements of molecular machines are usually binary -- that is, they are in one of two distinct states and not drifting in a continuous range. I have frequently emphasized the importance of binary (or more generally, digital) operations for predictability and reliability. The paper makes explicit the difference between a motor and a machine: a motor merely performs work, while a machine accomplishes a function. The machines described in the paper consist of multiple molecules joined together into machine systems. The introduction mentions Feynman's "atom by atom" approach only to disagree with it: it seems that although some physicists liked the idea, chemists "know" that individual atoms are very reactive and difficult to manipulate, while molecules can be combined easily into systems. The authors note that "it is difficult to imagine that the atoms can be taken from a starting material and transferred to another material." However, the final section of this essay describes a system which does exactly that. "In view of the increasing demand for nano-engineering operations in 'bottom-up' nanotechnology, this method provides a tool that operates at the ultimate limits of fabrication of organic surfaces, the single molecule." This quote is from a paper in Nature Nanotechnology, describing how single molecules can be deposited onto a surface by transferring them from a scanning probe microscope tip. This sounds exactly like what molecular manufacturing needs, but it's not quite time to celebrate yet. There are a few things yet to be achieved before we can start producing diamondoid, but this work represents a very good start. In the canonical vision of molecular manufacturing, a small molecular fragment bonded to a "tool tip" (like a scanning probe microscope tip, only more precise) would be pressed against a chemically active surface; its bonds would shift from the tip to the surface; the tip would be retracted without the fragment; and the transfer of atoms would fractionally extend the workpiece in a selected location. In this work, a long polymer is attached to a scanning probe tip at one end, with the other end flopping free. Thus, the positional accuracy suffers. Multiple polymers are attached to the tip, and sometimes (though rarely) two polymers will transfer at once. The bond to the surface is not made under mechanical force, but simply because it is a type of reaction that happens spontaneously; this limits the scope of attachment chemistries and the range of final products to some extent. The bond between the polymer and the tip is not broken as part of the attachment to the surface; in other words, the attachment and detachment do not take place in a single reaction complex. Instead, the attachment happens first, and then the molecule is physically pulled apart when the tip is withdrawn, and separates at the weakest link. Despite these caveats, the process of depositing single polymer molecules onto a surface is quite significant. First, it "looks and feels" like mechanosynthesis, which will make it easier for other researchers to think in such directions. Second, there is no actual requirement for the molecular transfer to take place in a single reaction complex; if it happens in two steps, the end result is still a mechanically guided chemical synthesis of a covalently bonded structure. The lack of placement precision is somewhat troubling if the goal is to produce atomically precise structures; however, there may be several ways around this. First, a shorter and less floppy polymer might work. I suspect that large polymers were used here to make them easier to image after the transfer. Second, the molecular receptors on the surface could be spaced apart by any of a number of methods. The tip with attached molecule(s) could be characterized by scanning a known surface feature, to ensure that there was a molecule in a suitable position and none in competing positions; this could allow reliable transfer of a single molecule. The imprecision issues raised by the use of floppy polymers would not apply to the transfer of single atoms. But is such a thing possible? In fact, it is. In 2003, the Oyabu group in Japan was able to transfer a single silicon atom from a covalent silicon crystal to a silicon tip, then put it back. More recently, citing Oyabu's work, another group has worked out "proposed new atomistic mechanism and protocols for the controlled manipulation of single atoms and vacancies on insulating surfaces." Apparently, this sort of manipulation is now well enough understood to be usefully simulated, and it seems that the surface can be scanned in a way that detects single-atom "events" without disrupting the surface. Molecular manufacturing is often criticized as viewing atoms as simple spheres to be handled and joined. This is a straw man, since atomic transfer between molecules is well known in chemistry, and no one is seriously proposing mechanosynthetic operations on isolated or unbonded atoms. Nevertheless, the work cited in the previous paragraph indicates that even a "billiard ball" model of atoms may occasionally be relevant. It is sometimes useful to think of molecules -- even biomolecules -- as simple chunks of material with structure and position. Depending on the molecule, this view can be accurate enough for invention and even study. The results described here imply that a molecular manufacturing view of molecules -- as machines that perform functions thanks to their structure -- is not flawed or inadequate, but may be beneficial. It may even lead to new chemical capabilities, as demonstrated by the mechanophore system. The relative unpopularity of the mechanical view of molecules may be a result of the historical difficulty of observing and manipulating individual molecules and atoms. As tools improve, the mechanical interpretation may find increasing acceptance and utility. Although it cannot supplant the more accurate quantum model, the mechanical model may turn out to be quite suitable for certain molecular machine systems. A molecular cage holds a potent and toxic anti-tumor drug. The cage has a lid that can be opened by a different part of the molecule binding to a marker that is on the surface of tumor cells. So the poison stays caged until the molecular machine bumps into a tumor cell and sticks there; then it is released and kills the cell. Researchers are getting to the point where they could design this system — they could plan it, engineer it, design a trial version, test it, modify the design, and before too long, have a machine that works the way they intend. It is tempting to view this as the ultimate goal of nanotechnology: to be able to design molecular systems to perform intricate tasks like anti-cancer drug delivery. But the system described above is limited in a way that future systems will not be. It is a machine, but it is not a robot. While researching this essay, I tried to find a definition of "robot" that I could extend to nanorobotics. I was unable to find a consistent definition of robot. Several web sites tried to be rigorous, but the one I found most insightful was Wikipedia, which admits that there is no rigorous definition. So I won't try to give a definition, but rather describe a continuum. The more robotic a machine is, the more new uses you can invent for it. Likewise, the more robotic it is, the less the designer knows about exactly what it will be used for. A machine in which every component is engineered for a particular function is not very robotic. In the molecular machine described above, each component would have been carefully designed to work exactly as intended, in concert with the other carefully-designed pieces. In order to change the function of the machine, at least one component would have to be redesigned. And with the current state of the art, the redesign would not simply be a matter of pulling another part out of a library — it would require inventing something new. The machine's function may be quite elegant, but the design process is laborious. Each new machine will cost a lot, and new functions and applications will be developed only slowly. The next stage is to have a library of interchangeable components. If a bigger cage is needed, just replace the cage; if a different cell sensor is needed, swap that out. This is a level of engineered flexibility that does not exist yet on the molecular scale. Design will be easier as this level of capability is developed. But it is still not very robotic, just as building a machine out of standard gears rather than special-order gears does not make it more robotic. There are levels beyond this. Also, this flexibility comes at the cost of being limited to standard parts; that cost will eventually be mitigated, but not until very robotic (fully programmable) machines are developed. A stage beyond interchangeable components is configurable components. Rather than having to build a different physical machine for each application, it may be possible to build one machine and then select one of several functions with some relatively simple manipulations, after manufacture and before use. This requires designing each function into the machine. It may be worth doing in order to save on manufacturing and logistical costs: fewer different products to deal with. There is another reason that gains importance with more complex products: if several choices can be made at several different stages, then, for example, putting nine functions (three functions at each of three levels) into the product may allow 27 (3x3x3) configuration options. The first configurable products will be made with each possible configuration implemented directly in machinery. More complex configuration options will be implemented with onboard computation and control. The ultimate extent of this, of course, is to install a general-purpose computer for software control of the product. Once a computer is onboard, functions that used to be done in hardware (such as interpreting sensory data) can be digitized, and the functionality of the product can be varied over a wide range and made quite complex simply by changing the programming; the product can also change its behavior more easily in response to past and present external conditions. At this point, it starts to make sense to call the product a robot. There are several things worth noticing about this progression from single-purpose specially-designed machines to general-purpose computer-controlled robots. The first is that it applies not only to medical devices, as in the example that opened this essay, but to any new field of devices. The second thing to notice is that it is a continuum: there is no hard-edged line. Nevertheless, it is clear that there is a lot of room for growth beyond today's molecular constructions. The third thing to notice is that even today's mature products have not become fully robotic. A car contains mostly special-purpose components, from the switches that are hardwired directly to lights, right down to the tires that are specialized for hard-paved surfaces. That said, a car does contain a lot of programmable elements, some of which might justifiably be called robotic: most of the complexity of the antilock brake system is in the software that interprets the sensors. At what points can we expect molecular machine systems to advance along this continuum? I would expect the step from special-case components to interchangeable components to begin over the next few years, as early experiments are analyzed, design software improves, and the various molecular design spaces start to become understood. (The US National Science Foundation’s “four generations” of nanotechnology seem to suggest this path toward increased interoperability of systems.) Configurable components have already been mentioned in one context: food products where the consumer can select the color or flavor. They may also be useful in medicine, where different people have a vast range of possible phenotypes. And they may be useful in bio-engineered or fully artificial bacteria, where it may be more difficult to create and maintain a library of strains than to build in switchable genes. Programmable products, with onboard digital logic, will probably have to wait for the development of molecular manufacturing. Prior to molecular manufacturing, adding a single digital switch will be a major engineering challenge, and adding enough to implement digital logic will probably be prohibitive in almost all cases. But with molecular manufacturing, adding more parts to the product being constructed will simply be a matter of tweaking the CAD design: it will add almost no time or cost to the actual manufacture, and because digital switches have a simple repeatable design that is amenable to design rules, it should not require any research to verify that a new digital layout will be manufactured as desired. What this all implies is that before molecular manufacturing arrives, products will be designed with all the "smarts" front-loaded in the work of the molecular "mechanical" engineers. Each product will be specially created with its own special-purpose combination of "hardware" elements, though they may be pulled from a molecular library. But for products built with molecular manufacturing, the product designers will find it much easier in most cases to offload the complexity to onboard computers. Rather than wracking their brains to come up with a way to implement some clever piece of functionality in the still-nascent field of molecular mechanics, they often will prefer to specify a sensor, an actuator, and a computer in the middle. By then, computer programming in the modern sense will have been around for almost three-quarters of a century. Digital computation will eclipse molecular tweaking as surely as digital computers eclipsed analog computers. And then the fun begins. Digital computers had fully eclipsed analog computers by about the mid-1950's — before most people had even heard of computers, much less used one. Think of all that's happened in computers since: the Internet, logistics tracking, video games, business computing, electronic money, the personal computer, cell phones, the Web, Google... Most of the comparable advances in nanotechnology are still beyond anyone's ability to forecast. Regardless of speculation about long-term possibilities, it seems pretty clear that when molecular machines first become programmable, we can expect that the design of "standard" products will rapidly become easier. This may happen even faster than the advance of computers in the 20th century, because many of today's software and hardware technologies will be portable to the new systems. Despite the impressive work currently being done in molecular machines, and despite the rapid progress of that work, the development of molecular manufacturing in the next decade or so is likely to yield a sudden advance in the pace of molecular product design, including nanoscale robotics. There's a Paul Simon song that goes, "You know the nearer your destination, the more you're slip-sliding away." Thinking about modern plans for increasingly sophisticated nano-construction, I'm reminded of that song. As I argued in a CRN blog entry recently, it may turn out that developments which could bring molecular manufacturing closer also will help to distract from the ultimate power of the molecular manufacturing approach. People may say, "We already can do this amazing thing; what more do we need?" In this essay, I'll talk about a few technologies that may get us part way to molecular manufacturing. I'll discuss why they're valuable -- but not nearly as valuable as full molecular manufacturing could be. And I'll raise the unanswerable question of whether everyone will be distracted by near-term possibilities...or whether most people will be distracted, and thus unprepared when someone does move forward. The first technology is Zyvex's silicon-building system that I discussed in another recent blog article. Their plan is to take a silicon surface, carefully terminated with one layer of hydrogen; use a scanning probe microscope to remove the hydrogen in certain spots; hit it with a chemical that will deposit a single additional silicon layer in the "depassivated" areas; and repeat to build up multiple layers. As long as the scanning probe can remove single, selected hydrogens -- and this capability has existed for a while, at least in the lab -- then this approach should be capable of building 3D structures (or at least, 2.5D) with atomic precision. As I noted in that blog article, this "Atomically Precise Manufacturing" plan can be extended in several ways for higher throughput and a broader range of materials. The system may even be able to construct one of the key components used in the fabrication machine. But, as I also noted, this will not be a nanofactory. It will not be able to build the vast majority of its own components. It will not be able to build on a large scale, because the machine will be immensely larger than its products. If you could build anything you wanted out of a million atoms of silicon, with each atom placed precisely where you wanted it, what would you build? Well, it's actually pretty hard to think of useful things to build with only one million atoms. A million atoms would be a very large biomolecule, but biomolecules are a lot more complex per atom than silicon lattice. And without the complexity of bio-type molecules, a million atoms is really too small to build much of anything. You could build a lot of different structures for research, such as newfangled transistors and quantum dots, perhaps new kinds of sensors (but then you'd have to solve the problem of packaging them), and perhaps some structures that could interact with other molecules in interesting ways (but only a few at a time). Another approach to building nanoscale structures uses self-assembly. In the past, I haven't thought much of self-assembly, because it requires all the complexity of the product to be built into the component molecules before they are mixed together. For most molecules, this is a severe limitation. However, DNA can encode large amounts of information, and can convert that information more or less directly into structure. Most self-assembled combinations are doing well to be able to form stacks of simple layers. DNA can form bit-mapped artistic designs and three-dimensional geometric shapes. A recent breakthrough in DNA structure engineering has made it much easier to design and create the desired shapes. The shapes are formed by taking a long inexpensive strand of DNA, and fastening it together with short, easily-synthesized DNA "staples" that each bind to only one place on the strand; thus, each end of the staple joins two different parts of the strand together. This can, with fairly high reliability, make trillions of copies of semi-arbitrary shapes. In each shape, the DNA components (nucleotides) will be in the right place within a nanometer or so, and the connection of each atom relative to its neighbors will be predictable and engineerable. Building atomically precise structures sounds enough like molecular manufacturing to be misleading. If researchers achieve it, and find that it's not as useful as the molecular manufacturing stories led them to expect, they may assume that molecular manufacturing won't be very useful either. In a way, it's the opposite problem from the one CRN has been facing for the past four years: rather than thinking that molecular manufacturing is impossible, they may now think that it's already happened, and was not a big deal. Of course, the technologies described above will have limitations. One of the most interesting limitations is that they cannot build a significant part of the machines that built them. As far as I can see, DNA stapling will always be dependent on big machines to synthesize DNA molecules, measure them out, and stir them together. No one has proposed building DNA-synthesizer machines out of DNA. The cost of DNA synthesis is falling rapidly, but it is still far above the price where you could commission even a sub-micron DNA sculpture for pocket change. This also implies that there is no way to ramp up production beyond a certain rate; the synthesizing machines simply wouldn't be available. And although the Zyvex process doesn't exist yet, I'm sure it will be at least as limited by the cost and scarcity of the machines involved. A very old saying reminds us, "When all you have is a hammer, everything looks like a nail." So if atomically precise shapes can be built by layering silicon, or by joining DNA, then any limitations in that technology will be approached by trying to improve that technology. Typically, people who have a perfectly good technology won't say, "I'll use my technology to invent a better one that will completely eclipse and obsolete the one I have now." Change never comes easily. Instead of seeking a better technology, people usually develop incremental fixes and improvements for the technology they already have. So the question remains, will everyone assume that technologies such as Atomically Precise Manufacturing and DNA stapling are the wave of the future, and work on improving those technologies as their shortfalls become apparent? Or will someone be able to get funding for the purpose of bypassing those technologies entirely, in order to produce something better? It will only take one visionary with access to a funding source. The cost of developing molecular manufacturing, even today, appears to be well within the reach of numerous private individuals as well as a large number of national governments. And the cost will continue to fall rapidly. So if the mainstream remains uninterested in molecular manufacturing, slipping seamlessly from denial into apathy, the chance that someone outside the mainstream will choose to develop it should rapidly approach certainty. If finished products of molecular manufacturing will end up costing too much, then the whole field might as well be scrapped now. But how much is too much? And without knowing in detail how nanofactories will manufacture stuff, how can we be sure that it actually will be worth developing and building them? In this essay, I'll explore ways that we can reason about the costs of molecular construction even with the existing knowledge gaps. The cost of products made by molecular manufacturing will depend on the cost of inputs and the cost of the machine that transforms the inputs into product. The inputs are chemical feedstock, power, and information. The manufacturing system will be an array of massive numbers of nanoscale machines which process the input molecules and add them to build up nanoscale machine components, then join the components into the product. An ideal material for a molecular manufacturing system is a strongly bonded covalent solid like diamond or sapphire (alumina). To build this kind of crystalline material, just a few atoms at a time would be added, and the feedstock would be small molecules. Small molecules tend not to cost much in bulk; the limiting factor for cost in this kind of construction would probably be the power. I have calculated that a primitive manufacturing system with an inefficient (though flexible) design might require 200 kWh per kg of product. Given the high strength of the product, this cost is low enough to build structural materials; it would be quite competitive with steel or aluminum. Exponential manufacturing implies that the size of the manufacturing system would not be limited; it appears to make sense to talk of building vehicles and even houses by such methods. With the strength of diamond, a pressure-stiffened (inflatable) structural panel might cost less than a dollar per square meter. Even if this is off by multiple orders of magnitude, the materials might still be useful in aerospace. The earliest molecular manufacturing systems may not be able to do mechanosynthesis of covalent solids; instead, they may use nanoscale actuators to join or place larger molecules. This would probably require a lot less precision, as well as using less energy per atom, but produce less strong and stiff materials. Also, the feedstock would probably be more costly — perhaps a lot more costly, on the order of dollars per gram rather than dollars per kilogram. So these products probably would not be used for large-scale structural purposes, though they might be very useful for computation, sensing, and display. The products might even be useful for actuation. As long as the product molecules didn't have to be immersed in water to maintain their shape or function, they might still get the scaling law advantages — power density and operation frequency — predicted for diamondoid machines. With a power density thousands of times greater than today's macro-scale machines, even expensive feedstock would be worth using for motors. When products are built with large machines that were built with other processes, the machines may cost vastly more than the products they manufacture. For example, each computer chip is worth only a few dollars, but it's made by machines costing many millions of dollars. But when the machine is made by the same process that makes its products, the machine will not cost more than the other products. To turn the argument around, for the nanofactory concept to work at all, nanofactories have to be able to build other nanofactories. This implies minimum levels of reliability and speed. But given even those minimum levels, the nanofactory would be able to build products efficiently. It is, of course, possible to propose nanofactory designs that appear to break this hopeful analysis. For example, a nanofactory that required large masses of passive structure might take a long time to fabricate its mass of product. But the question is not whether broken examples can be found. The question is whether a single working example can be found. Given the number of different chemistries available, from biopolymer to covalent solid, and the vast number of different mechanical designs that could be built with each, the answer to that question seems very likely to be Yes. Will low-cost atomically precise products still be valuable when nanofactories are developed, or will other nanotechnologies have eclipsed the market? For an initial answer, we might usefully compare molecular manufacturing with semiconductor manufacturing. In 1965, transistors cost more than a dollar. Today, they cost well under one-millionth of a dollar, and we can put a billion of them on a single computer chip. So the price of transistors has fallen more than a million-fold in 40 years, and the number of transistors on a chip has increased similarly. But this is still not very close to the cost-per-feature that would be needed to build things atom-by-atom. Worldwide, we build 1018 transistors per year; if each transistor were an atom, we would be building about 20 micrograms of stuff — worldwide — in factories that cost many billions of dollars. And in another 40 years, if the semiconductor trends continue, those billions of dollars would still be producing only 20 grams of stuff per year. By contrast, a one-gram nanofactory might produce 20 grams of stuff per day. So when nanoscale technologies are developed to the point that they can build a nanofactory at all, it appears worthwhile to use them to do so, even at great cost; the investment will pay back quite quickly. The previous paragraph equated transistors with atoms. Of course this is just an analogy; putting an atom precisely in place may not be very useful. But then again, it might. The functionality of nanoscale machinery will depend largely on the number of features it includes, and if each feature requires only a few atoms, then precise atom placement with exponential molecular manufacturing technology implies the ability to build vast numbers of features. For a surprisingly wide range of implementation technologies, molecular manufacturing appears to provide a low-cost way of building huge numbers of features into a product. For products that depend on huge numbers of features — including computers, some sensors and displays, and perhaps parallel arrays of high-power-density motors— molecular manufacturing appears to be a lower-cost alternative to competing technologies. Even decades in the future, molecular manufacturing may still be able to build vastly more features at vastly lower cost than, for example, semiconductor manufacturing. And for some materials, it appears that even structural products may be worth building. There used to be an idea floating around -- maybe it still is -- that if our current technological civilization collapsed, the human race would likely not get a second chance because we've already used up all the easy-to-mine metals and fossil fuels. Among other places, this idea showed up in Larry Niven's Ringworld novels: technology in a giant artificial space habitat collapsed, and because there were no metal stocks available, civilization could not re-bootstrap itself. Fortunately, metals, though very useful, do not appear to be necessary for a high-tech civilization. And there are lots of sources of energy other than fossil fuels. Since fossil fuels add carbon dioxide to the atmosphere, and since metal extraction causes various kinds of pollution (not to mention political problems), the question is of more than theoretical interest. An advanced, elegant technology should be able to use more local and greener resources. Carbon is available everywhere on the surface of our planet. It may require energy to convert it to useful form, but carbon-based solar collectors appear to be feasible, and biomass can be used for modest amounts of energy. As a structural material, carbon ranges from good to exceptional. Carbon fiber composites are lighter and stronger than steel. Virtually all plastics are carbon-based. Carbon nanotubes are dozens of times stronger than steel -- significantly better than carbon fiber. Carbon is an extremely versatile element. Pure carbon can be opaque or transparent; it can be an electrical conductor, semiconductor, or insulator; it can be rigid or flexible. In combination with other readily-available elements, carbon can make a huge variety of materials. As technology advances, our ability to build smaller machines also advances. Small machines work better; scaling laws mean that in general, smaller machines have higher power density, operating frequency, and functional density. This implies that, even if metals are needed to implement some functions, increasingly small amounts will be needed as technology advances. But small machines can implement a lot of functions -- actuation, sensing, computation, display -- simply by mechanical motion and structure. Examples abound in Robert Freitas's Nanomedicine I, which is available online in its entirety. This means that regardless of what molecular manufactured structures are built out of -- diamond, alumina, silica, or something else -- they probably will be able to do a lot of things based on their mechanical design rather than their elemental composition. Just for fun, let's consider how people deprived of metal (and with technical knowledge only slightly better than today's) might make their way back to a high technology level. Glass, of course, can be made with primitive technology. Polymers can be made from plants: plastic from corn, rubber from the sap of certain trees. So, test tubes and flexible tubing could be produced, and perhaps used to bootstrap a chemical industry. There are a number of ways to make carbon nanotubes, some of which use electric arcs. Carbon is fairly high-resistance (it was used for the first light bulb filaments), but might be adequate for carrying high voltage at low current, and it has a long history of use as discharge electrodes; an electrostatic generator could be made of glass and carbon, and that plus some mechanical pumps might possibly be enough to make nanotubes for high-quality wires. Computers would be necessary for any high-tech civilization. Carbon nanotubes are excellent electron emitters, so it might be possible to build small, cool, and reliable vacuum-tube computing elements. Note that the first electronic computers were made with vacuum tubes that used unreliable energy-consuming (heated) electron emitters; if they were cool and reliable, many emitters could be combined in a single vacuum enclosure. As an off-the-cuff guess: a computer made by hand, with each logic element sculpted in miniature, might require some thousands of hours of work, be small enough to fit on a large desk, and be as powerful as computers available in the 1960s or maybe even the 1970s. The IBM PC, a consumer-usable computer from the early 1980s, had about 10,000 logic elements in its processor and 70,000 in its memory; this could be made by hand if necessary, though computers suitable for controlling factory machines can be built with fewer than 10,000 elements total. Computer-controlled manufacturing machines would presumably be able to use nanotube-reinforced plastic to build a variety of structures comparable in performance to today's carbon-fiber constructions. Rather than milling the structures from large hunks of material, as is common with metals, they might be built additively, as rapid-prototyping machines are already beginning to do. This would reduce or eliminate the requirement for cutting tools. Sufficiently delicate additive-construction machines should also be able to automate the manufacture of computers. Although I've considered only a few of the many technologies that would be required, it seems feasible for a non-metals-based society to get to a level of technology roughly comparable to today's capabilities -- though not necessarily today's level of manufacturing efficiency. In other words, even if it was possible to build a car, it might cost 100 times as much to manufacture as today's cars. To build a technological civilization, manufacturing has to be cheap: highly automated and using inexpensive materials and equipment. Rather than try to figure out how today's machines could be translated into glass, nanotubes, and plastic without raising their cost, I'll simply suggest that molecular manufacturing will use automation, inexpensive materials, and inexpensive equipment. In that case, all that would be needed is to build enough laboratory equipment -- at almost any cost! -- to implement a recipe for bootstrapping a molecular manufacturing system. There are several plausible approaches to molecular manufacturing. One of them is to build self-assembled structures out of biopolymers such as DNA, structures complex enough to incorporate computer-controlled actuation at the molecular level, and then use those to build higher-performance structures out of better materials. With glass, plastic, electricity, and computers, it should be possible to build DNA synthesizers. Of course, it's far from trivial to do this effectively: as with most of the technologies proposed here, it would require either a pre-designed recipe or a large amount of research and development to do it at all. But it should be feasible. A recipe for a DNA-based molecular manufacturing system doesn't exist yet, so I can't describe how it would work or what other technologies would be needed to interface with it. But it seems unlikely that metal would be absolutely required at any stage. And -- as is true today -- once a molecular manufacturing proto-machine reached the exponential stage, where it could reliably make multiple copies of its own structure, it would then be able to manufacture larger structures to aid in interfacing to the macroscopic world. Once molecular manufacturing reaches the point of building large structures via molecular construction, metals become pretty much superfluous. Metals are metals because they are heavy atoms with lots of electrons that mush together to form malleable structures. Lighter atoms that form stronger bonds will be better construction materials, once we can arrange the bonds the way we want them -- and that is exactly what molecular manufacturing promises to do. Although molecular manufacturing and its products will be amazingly powerful, that power will not be unlimited. Products will have several important physical limitations and other technological limitations as well. It may be true, as Arthur C. Clarke suggests, that "any sufficiently advanced technology is indistinguishable from magic," but early molecular manufacturing (diamondoid-based nanofactories) will not, by that definition, be sufficiently advanced. Molecular manufacturing is based on building materials by putting atoms together using ordinary covalent bonds. This means that the strength of materials will be limited by the strength of those bonds. For several reasons, molecular manufacturing-built materials will be stronger than those we are used to. A structural defect can concentrate stress and cause failure; materials built atom-by-atom can be almost perfect, and the few remaining defects can be dealt with by branched structures that isolate failures. By contrast, today's carbon fiber is chock-full of defects, so is much weaker than it could be. Conventional metallurgy produces metal that is also full of defects. So materials built with molecular manufacturing could approach the strength of carbon nanotubes -- about 100 times stronger than steel -- but probably not exceed that strength. Energy storage will be bulky and heavy. It appears that the best non-nuclear way to store energy is via ordinary chemical fuel. In other words, energy storage won't be much more compact than a tank of gasoline. Small nuclear energy sources, on the order of 10-micron fuel particles, appear possible if the right element is chosen that emits only easily-shielded particles. However, this would be expensive, unpopular, and difficult to manufacture, and probably will be pretty rare. To make the most of chemical energy, a few tricks can be played. One (suggested by Eric Drexler in conversation) is building structures out of carbon that store mechanical energy; springs and flywheels can store energy with near-chemical density, because they depend on stretched bonds. After the mechanical energy is extracted, the carbon can be oxidized to provide chemical energy. As it happens, carbon oxidized with atmospheric oxygen appears to be the most dense store of chemical energy. Of course, if the mechanical structures are not oxidized, they can be recharged with energy from outside the device, in effect forming a battery-like energy store with very high energy density compared to today's batteries. Another trick that can make the most of chemical energy stores is to avoid burning them. If energy is converted into heat, then only a fraction of it can be used to do useful work; this is known as the Carnot limit. But if the energy is never thermalized -- if the atoms are oxidized in a fuel cell or in an efficient mechanochemical system -- then the Carnot limit does not apply. Fuel cells that beat the Carnot limit exist today. For a lot more information about energy storage, transmission, and conversion, see Chapter 6 of Nanomedicine I (available online). Computer power will be effectively unlimited by today's standards, in the sense that few algorithms exist that could make efficient use of the computers molecular manufacturing could build. This does not mean that computer capacity will be literally unlimited. Conventional digital logic, storing information in stable physical states, may be able to store a bit per atom. At that rate, the entire Internet (about 2 petabytes) could be stored within a few human cells (a few thousand cubic microns), but probably could not be stored within a typical bacterium. Of course, this does not take quantum computers into account. Molecular manufacturing's precision may help in the construction of quantum computer structures. Also, there may be arcane techniques that might store more than one bit per atom, or do computation with sub-atomic particles. But these probably would not work at room temperature. So for basic computer capacity, it's probably reasonable to stick with the estimates found in Nanosystems: 1017 logic gates per cubic millimeter, and 1016 instructions per second per watt. (A logic gate may require many more atoms than required to store a bit.) These numbers are from Chapter 1 of Nanosystems (available online). It is not yet known what kinds of chemistry the first nanofactories will do. Certainly they will not be able to do everything. Water, for example, is liquid at room temperature, and water molecules will not stay where they are placed unless the factory is operating at cryogenic temperatures. This may make it difficult to manufacture things like food. (Building better greenhouses, on the other hand, should be relatively straightforward.) Complicated molecules or arcane materials may require special research to produce. And, of course, no nanofactory will be able to convert one chemical element into another; if a design requires a certain element, that element will have to be supplied in the feedstock. The good news is that carbon is extremely versatile. Power supply and heat dissipation will have to be taken into account in some designs. Small widely-separated systems can run at amazing power densities without heating up their environment much. However, small systems may not be able to store much fuel, and large numbers of small systems in close proximity (as in some nanomedical applications) may still create heat problems. Large (meter-scale) systems with high functional density can easily overwhelm any currently conceived method of cooling. Drexler calculated that a centimeter-thick slab of solid nanocomputers could be cooled by a special low-viscosity fluid with suspended encapsulated ice particles. This is quite a high-tech proposal, and Drexler's calculated 100 kW per cubic centimeter (with 25% of the volume occupied by coolant pipes) probably indicates the highest cooling rate that should be expected. Most of the limitations listed here are orders of magnitude better than today's technology. However, they are not infinite. What this means is that anyone trying to project what products may be feasible with molecular manufacturing will have to do the math. It is probably safe to assume that a molecular manufacturing-built product will be one or two orders of magnitude (10 to 100 times) better than a comparable product built with today's manufacturing. But to go beyond that, it will be necessary to compute what capabilities will be available, and do at least a bit of exploratory engineering in order to make sure that the required functionality will fit into the desired product. Nanotechnology capabilities have been improving rapidly. More different things can be built, and the products can do more than they used to. As nanotechnology advances, CRN continually is asked: Why do we focus only on molecular manufacturing, when there's important stuff already being done? This essay will put the various levels of nanotechnology in perspective, showing where molecular manufacturing fits on a continuum of development -- quite far advanced in terms of capabilities. Along the way, this will show which kinds of nanotechnology CRN's concerns apply to. For another perspective on nanotechnology development, it's worth reading the section on "The Progression of Nanotechnology" (pages 3-6) from a joint committee economic study [PDF] for the U.S. House of Representatives. It does not divide nanotech along exactly the same lines, but it is reasonably close, and many of the projections echo mine. That document is also an early source for the NSF's division of nanotechnology into four generations. The development arc of nanotechnology is comparable in some ways to the history of computers. Ever since the abacus and clay tablets, people have been using mechanical devices to help them keep track of numbers. Likewise, the ancient Chinese reportedly used nanoparticles of carbon in their ink. But an abacus is basically a better way of counting on your fingers; it is not a primitive computer in any meaningful sense. It only remembers numbers, and does not manipulate them. But I am not going to try to identify the first number-manipulator; there are all sorts of ancient distance-measuring carts, timekeeping devices, and astronomical calculators to choose from. Likewise, the early history of nanotechnology will remain shrouded in myth and controversy, at least for the purposes of this essay. The first computing devices in widespread use were probably mechanical adding machines, 19th century cash registers, and similar intricate contraptions full of gears. These had to be specially designed and built, a different design for each different purpose. Similarly, the first nanotechnology was purpose-built structures and materials. Each different nanoparticle or nanostructure had a particular set of properties, such as strength or moisture resistance, and it would be used for only that purpose. Of course, a material might be used in many different products, as a cash register would be used in many different stores. But the material, like the cash register, was designed for its specialized function. Because purpose-designed materials are expensive to develop, and because a material is not a product but must be incorporated into existing manufacturing chains, these early types of nanotechnology are not having a huge impact on industry or society. Nanoparticles are, for the most part, new types of industrial chemicals. They may have unexpected or unwanted properties; they may enable better products to be built, and occasionally even enable new products; but they are not going to create a revolution. In Japan, I saw an abacus used at a train station ticket counter in the early 1990's; cash registers and calculators had not yet displaced it. The second wave of computing devices was an interesting sidetrack from the general course of computing. Instead of handling numbers of the kind we write down and count with, they handled quantities -- fuzzy, non-discrete values, frequently representing physics problems. These analog computers were weird and arcane hybrids of mechanical and electrical components. Only highly trained mathematicians and physicists could design and use the most complex of these computers. They were built this way because they were built by hand out of expensive components, and it was worth making each component as elegant and functional as possible. A few vacuum tubes could be wired up to add, subtract, multiply, divide, or even integrate and differentiate. An assemblage of such things could do some very impressive calculations -- but you had to know exactly what you were doing, to keep track of what the voltage and current levels meant and what effect each piece would have on the whole system. Today, nanotechnologists are starting to build useful devices that combine a few carefully-designed components into larger functional units. They can be built by chemistry, self-assembly, or scanning probe microscope; none of these ways is easy. Designing the devices is not easy. Understanding the components is somewhat easy, depending on the component, but even when the components appear simple, their interaction is likely not to be simple. But when your technology only lets you have a few components in each design, you have to get the most you can out of each component. It goes without saying that only experts can design and build such devices. This level of nanotechnology will enable new applications, as well as more powerful and effective versions of some of today's products. In a technical sense, it is more interesting than nanoparticles -- in fact, it is downright impressive. However, it is not a general-purpose technology; it is far too difficult and specialized to be applied easily to more than a tiny fraction of the products created today. As such, though it will produce a few impressive breakthroughs, it will not be revolutionary on a societal scale. It is worth noting that some observers, including some nanotechnologists, think that this will turn out to be the most powerful kind of nanotechnology. Their reasoning goes something like this: Biology uses this kind of elegant highly-functional component-web. Biology is finely tuned for its application, so it must be doing things the best way possible. And besides, biology is full of elegant designs just waiting for us to steal and re-use them. Therefore, it's impossible to do better than biology, and those who try are being inefficient in the short term (because they're ignoring the existing designs) as well as the long term (because biology has the best solutions). The trouble with this argument is that biology was not designed by engineers for engineers. Even after we know what the components do, we will not easily be able to modify and recombine them. The second trouble with the argument is that biology is constrained to a particular design motif: linear polymers modified by enzymes. There is no evidence that this is the most efficient possible solution, any more than vacuum tubes were the most efficient way to build computer components. A third weakness of the argument is that there may be some things that simply can't be done with the biological toolbox. Back when computers were mainly used for processing quantities representing physical processes, it might have sounded strange to say that some things couldn't be represented by analog values. But it would be more or less impossible to search a billion-byte text database with an analog computer, or even to represent a thousand-digit number accurately. It may seem strange to take a circuit that could add two high-precision numbers and rework it into a circuit that could add 1+1, so that a computer would require thousands of those circuits rather than dozens. But that is basically what was done by the designers of ENIAC, the famous early digital computer. There were at least two or three good reasons for this. First, the 1+1 circuit was not just high-precision, it was effectively infinite precision (until a vacuum tube burned out) because it could only answer in discrete quantities. You could string together as many of these circuits as you wanted, and add ten- or twenty-digit numbers with infinite precision. Second, the 1+1 circuit could be faster. Third, a computer doing many simple operations was easier to understand and reprogram than a computer doing a few complex operations. ENIAC was not revolutionary, compared with the analog computers of its day; there were many problems that analog computers were better for. But it was worth building. And more importantly, ENIAC could be improved by improving just a few simple functions. When transistors were invented, they quickly replaced vacuum tubes in digital computers, because digital computers required fewer and less finicky circuit designs. The third level of nanotechnology, which is just barely getting a toehold in the lab today, is massively parallel nano-construction via relatively large computer-controlled machines. For example, arrays of tens of thousands of scanning probes have been built, and these arrays have been used to build tens of thousands of micro-scale pictures, each with tens of thousands of nano-scale dots. That's a billion features, give or take an order of magnitude -- pretty close to the number of transistors on a modern computer chip. That is impressive. However, a billion atoms would make an object about the size of a bacterium; this type of approach will not be used to build large objects. And although I can imagine ways to use it for general-purpose construction, it would take some work to get there. Because it uses large and delicate machines that it cannot itself build, it will be a somewhat expensive family of processes. Nevertheless, as this kind of technology improves, it may start to steal some excitement from the bio-nano approach, especially once it becomes able to do atomically precise fabrication using chemical reactions. Massively parallel nano-construction will likely be useful for building better computers and less expensive sensors, as well as a lot of things no one has thought of yet. It will not yet be revolutionary, by comparison with what comes later, but it starts to point the way toward revolutionary construction capabilities. In particular, some nano-construction methods, such as Zyvex's Atomically Precise Manufacturing, might eventually be able to build their improved versions of their own tools. Once computer-controlled nano-fabrication can build improved versions of its own tools, it will start to lead to the next level of nanotechnology: exponential manufacturing. But until that point, it appears too primitive and limited to be revolutionary. ENIAC could store the numbers it was computing on, but the instructions for running the computation were built into the wiring, and it had to be rewired (but not rebuilt) for each different computation. As transistors replaced vacuum tubes, and integrated circuits replaced transistors, it became reasonable for computers to store their own programs in numeric form, so that when a different program was needed, the computer could simply read in a new set of numbers. This made computing a lot more efficient. It also made it possible for computers to help to compile their own programs. Humans could write programs using symbols that were more or less human-friendly, and the computer could convert those symbols into the proper numbers to tell the computer what to do. As computers became more powerful, the ease of programming them increased rapidly, because the symbolic description of their program could become richer, higher-level, and more human-friendly. (Note that, in contrast, a larger analog computer would be more difficult to program.) Within a decade after ENIAC, hobbyists could learn to use a computer, though computers were still far too expensive for hobbyists to own. The fourth level of nanotechnology is early exponential manufacturing. Exponential manufacturing means that the manufacturing system can build most of its key components. This will radically increase the throughput, will help to drive down the cost, and also implies that the system can build improved versions of itself fairly quickly. Although it's not necessarily the case that exponential manufacturing will use molecular operations and molecular precision (molecular manufacturing), this may turn out to be easier than making exponential systems work at larger scales. Although the most familiar projections of molecular manufacturing involve highly advanced materials such as carbon lattice (diamondoid), the first molecular manufacturing systems likely will use polymers that are weaker than diamondoid but easier to work with. Exponential manufacturing systems with large numbers of fabrication systems will require full automation, which means that each operation will have to be extremely reliable. As previous science essays have discussed, molecular manufacturing appears to provide the required reliability, since covalent bonding can be treated as a digital operation. In the same way that the 1+1 circuit is more precise than the analog adder, adding a small piece onto a molecule can be far more precise and reliable than any currently existing manufacturing operation -- reliable enough to be worth doing millions of times rather than using one imprecise bulk operation to build the same size of structure. Early exponential manufacturing will provide the ability to build lots of truly new things, as well as computers far in advance of today's. With molecular construction and rapid prototyping, we will probably see breakthrough medical devices. Products may still be quite expensive per gram, especially at first, since early processes are likely to require fairly expensive molecules as feedstocks. They may also require some self-assembly and some big machines to deal with finicky reaction conditions. This implies that for many applications, this technology still will be building components rather than products. However, unlike the cost per gram, the cost per feature will drop extremely rapidly. This implies far less expensive sensors. At some point, as products get larger and conventional manufacturing gets more precise, it will be able to interface with molecular manufactured products directly; this will greatly broaden the applications and ease the design process. The implications of even early molecular manufacturing are disruptive enough to be interesting to CRN. Massive sensor networks imply several new kinds of weapons, as do advanced medical devices. General-purpose automated manufacturing, even with limitations, implies the first stirrings of a general revolution in manufacturing. Machines working at the nanoscale will not only be used for manufacturing, but in a wide variety of products, and will have far higher performance than larger machines. In one sense, there is a continuum from the earliest mainframe computers to a modern high-powered gaming console. The basic design is the same: a stored-program digital computer. But several decades of rapid incremental change have taken us from million-dollar machines that printed payroll checks to several-hundred-dollar machines that generate real-time video. A modern desktop computer may contain a million times as many computational elements as ENIAC, each one working almost a million times as fast -- and the whole thing costs thousands of times less. That's about fifteen orders of magnitude improvement. For what it's worth, the functional density of nanometer-scale components is eighteen orders of magnitude higher than the functional density of millimeter-scale components. Diamondoid molecular manufacturing is expected to produce the same kind of advances relative to today's manufacturing. The implications of this level of technology, and the suddenness with which it might be developed, have been the focus of CRN's work since our founding almost five years ago. They cannot be summarized here; they are too varied and extreme. We hope you will learn more and join our efforts to prepare the world for this transformative technology. Damian Allis, Research Professor of Chemistry at Syracuse University and Senior Scientist for Nanorex, Inc.
What follows is a brief series of notes and observations about the Roadmap Conference, some of the activities leading up to it, and a few points about the state of some of the research that the Roadmap is hoping to address. All views expressed are my own and not necessarily those of other Roadmap participants, collaborators, my affiliated organizations (though I hope to not straddle that fine line between "instigation" and "inflaming" in anything I present below). There are, basically, three formats for scientific conferences. The first is discipline-intensive, where everyone attending needs no introduction and certainly needs no introductory slides (see the division rosters at most any National ACS conference). The only use of showing an example of Watson-Crick base pairing at a DNA nanotechnology conference of this format is to find out who found the most aesthetically-pleasing image on "the Google." There is the middle ground, where a single conference will have multiple sessions divided into half-day or so tracks, allowing the carbon nanotube chemists to see work in their field, then spend the rest of the conference arguing points and comparing notes in the hotel lobby while the DNA scientists occupy the conference room. The FNANO conference is of a format like this, which is an excellent way to run a conference when scientists dominate the attendee list. Finally, there is the one-speaker-per-discipline approach, where introductory material consumes roughly 1/3 of each talk and attendees are given a taste of a broad range of research areas. Such conferences are nontrivial to organize for individual academics within a research plan but are quite straightforward for external organizations with suitable budgets to put together. To my mind, Foresight came close to perfecting this final approach for nanoscience over the course of its annual Conferences on Molecular Nanotechnology. Much like the organizational Roadmap meetings and the Roadmap conference itself, these Foresight conferences served as two-day reviews of the entire field of nanoscience by people directly involved in furthering the cause. In my own case, research ideas and collaborations were formed that continue to this day that I am sure would not have otherwise. The attendee lists were far broader than the research itself, mixing industry (the people turning research into products), government (the people turning ideas into funding opportunities), and media (the people bringing new discoveries to the attention of the public). Enough cannot be said about the use of such broad-based conferences, which are instrumental in endeavors to bring the variety of research areas currently under study into a single focus, such as in the form of a technology Roadmap. Why A "Productive Nanosystems" Roadmap? The semiconductor industry has its Roadmap. The hydrogen storage community has its Roadmap. The quantum computing and cryptography communities have their Roadmaps. These are major research and development projects in groundbreaking areas that are not in obvious competition with one another but see the need for all to benefit from all of the developments within a field (in spirit, anyway). How could a single individual or research group plan 20 years into the future (quantum computing) or plan for the absolute limit of a technology (semiconductor)? The Technology Roadmap for Productive Nanosystems falls into the former category, an effort to as much take a snapshot of current research and very short-term pathways towards nanosystems in general as it is to begin to plot research directions that take advantage of the continued cross-disciplinary efforts now begun in National Labs and large research universities towards increasing complexity in nanoscale study. On one far end of the spectrum, the "productive nanosystem" in all of its atomically-precise glory as envisioned by many forward-thinking scientists is a distant, famously debated, and occasionally ridiculed idea that far exceeds our current understanding within any area of the physical or natural sciences. Ask the workers on the first Model T assembly line how they expected robotics to affect the livelihoods and the productivity of the assembly lines of their grandchildren's generation, and you can begin to comprehend just how incomprehensible the notion of a fully developed desktop nanofactory or medical nanodevice is even to many people working in nanoscience. On the other end of the spectrum (and the primary reason, I think, in molecular manufacturing), it seems rather narrow-minded and short-sighted to believe that we will never be able to control the fabrication of matter at the atomic scale. The prediction that scientists will still be unable in 50 years to abstract a carbon atom from a diamond lattice or build a computer processing unit by placing individual atoms within an insulating lattice of other atoms seems absurd. That is, of course, not to say that molecular manufacturing-based approaches to the positional control of individual atoms for fabrication purposes will be the best approach to generating various materials, devices, or complicated nanosystems (yes, I'm in the field and I state that to be a perfectly sound possibility). To say that we will never have that kind of control, however, is a bold statement that assumes scientific progress will hit some kind of technological wall that, given our current ability to manipulate individual hydrogen atoms (the smallest atoms we have to work with) with positional control on atomic lattices, seems to be sufficiently porous that atomically precise manufacturing, including the mechanical approaches envisioned in molecular manufacturing research, will continue on undaunted. At the maturation point of all possible approaches to atomic manipulation, engineers can make the final decision of how best to use the available technologies. Basically and bluntly, futurists are planning the perfect paragraph in their heads while researchers are still putting the keyboard together. That, of course, has been and will always be the case at every step in human (and other!) development. And I mean that in the most positive sense of the comparison. Some of my best friends are futurists and provide some of the best reasons for putting together that keyboard in the first place. Perhaps a sea change over the next ten years will involve molecular manufacturing antagonists beginning to agree that "better methods exist for getting A or B" instead of now arguing that "molecular manufacturing towards A and B is a waste of a thesis." That said, it is important to recognize that the Technology Roadmap for Productive Nanosystems is not a molecular manufacturing Roadmap, rather a Roadmap that serves to guide the development of nanosystems capable of atomic precision in the manufacturing processes of molecules and larger systems. The difference is largely semantic, though, founded in the descriptors of molecular manufacturing as some of us have come to know and love it. Nanosystems are interacting nanoscale structures, components, and devices. Functional nanosystems are nanosystems that process material, energy, or information. Atomically precise structures are structures that consist of a specific arrangement of atoms. Atomically precise technology (APT) is any technology that exploits atomically precise structures of substantial complexity. Atomically precise functional nanosystems (APFNs) are functional nanosystems that incorporate one or more nanoscale components that have atomically precise structures of substantial complexity. Atomically precise self-assembly (APSA) is any process in which atomically precise structures align spontaneously and bind to form an atomically precise structure of substantial complexity. Atomically precise manufacturing (APM) is any manufacturing technology that provides the capability to make atomically precise structures, components, and devices under programmable control. Atomically precise productive nanosystems (APPNs) are functional nanosystems that make atomically precise structures, components, and devices under programmable control, that is, they are advanced functional nanosystems that perform atomically precise manufacturing. The last definition is the clincher. It combines atomic precision (which means you know the properties of a system at the atomic level and can, given the position of one atom, know absolutely about the rest of the system) and programmable control (meaning information is translated into matter assembly). Atomic precision does not mean "mostly (7,7) carbon nanotubes of more-or-less 20 nm lengths," "chemical reactions of more than 90% yield," "gold nanoparticles of about 100 nm diameters," or "molecular nanocrystals with about 1000 molecules." That is not atomic precision, only our current level of control over matter. I am of the same opinion as J. Fraser Stoddart, who described the state of chemistry (in his Feynman Experimental Prize lecture) as "an 18 month old" learning the words of chemistry but unable to speak the short sentences of supramolecular assembly and simple functional chemical systems, make paragraphs of complex devices from self-assembling or directed molecules, or the novels that approach the scales of nanofactories, entire cells, or whatever hybrid system first can be pointed to by all scientists as a first true productive nanosystem. Plainly, there is no elegant, highly developed field in the physical or natural sciences. None. Doesn't exist, and anyone arguing otherwise is acknowledging that progress in their field is dead in the water. Even chiseled stone was state-of-the-art at one point. The closest thing we know of towards the productive nanosystem end is the ribosome, a productive nanosystem that takes information (mRNA) and turns it into matter (peptides) using a limited set of chemical reactions (amide bond formation) and a very limited set of building materials (amino acids) to make a very narrow range of products (proteins) which just happen to, in concert, lead to living organisms. The ribosome serves as another important example for the Roadmap. Atomic precision in materials and products does not mean absolute positional knowledge in an engineering, fab facility manner. Most cellular processes do not require knowledge of the location of any component, only that those components will eventually come into Brownian-driven contact. Molecular manufacturing proponents often point to the ribosome as "the example" among reasons to believe that engineered matter is possible with atomic precision. The logical progression from ribosome to diamondoid nanofactory, if that progression exists on a well-behaved wavefunction (continuous, finite -- yeesh-- with pleasant first derivatives), is a series of substantial leaps of technological progress that molecular manufacturing opponents believe may/can/will never be made. Fortunately, most of them are not involved in research towards a molecular manufacturing end and so are not providing examples of how it cannot be done, while those of us doing molecular manufacturing research are both showing the potential, and the potential pitfalls, all the while happy to be doing the dirty work for opponents in the interest in pushing the field along. It is difficult to imagine that any single discipline will contain within its practitioners all of the technology and know-how to provide the waiting world with a productive nanosystem of any kind. The synthetic know-how to break and form chemical bonds, the supramolecular understanding to be able to predict how surfaces may interact as either part of self-assembly processes or as part of mechanical assembly, the systems design to understand how the various parts will come together, the physical and quantum chemistry to explain what's actually happening and recommend improvements as part of the design and modeling process, the characterization equipment to follow both device assembly and manufacturing: each of these aspects relevant to the assembly and operations of productive nanosystems are, in isolation, areas of current research that many researchers individually devote their entire lives to and that are all still very much in development. However, many branches of science are starting to merge and perhaps the first formal efforts at systems design among the many disciplines are likely to be considered the ACTUAL beginning of experimental nanotechnology. The interdisciplinaritization (yes, made that one up myself) of scientific research is being pushed hard at major research institutions by way of the development of Research Centers, large-scale facilities that intentionally house numerous departments or simply broad ranges of individual research. Like research efforts into atomically precise manufacturing, the pursuit of interdisciplinary research is a combination of bottom-up and top-down approaches, with the bottom-up effort a result of individual researchers collaborating on new projects as ideas and opportunities allow and the top-down efforts a result of research universities funding the building of Research Centers and, as an important addition, state and federal funding agencies providing grant opportunities supporting multi-disciplinary efforts and facilities. But is that enough? Considering all of the varied research being performed in the world, is it enough that unionized cats are herding themselves into small packs to pursue various ends, or is there some greater benefit to having a document that not only helps to put their research into the context of the larger field of all nanoscience research, but also helps them draw connections to other efforts? Will some cats choose to herd themselves when presented with a good reason? The Roadmap is not only a document that describes approaches to place us on the way to Productive Nanosystems. It is also a significant summary of current nanoscale research that came out of the three National Lab Working Group meetings. As one might expect, these meetings were very much along the lines of a typical Foresight Conference, in which every half hour saw a research presentation on a completely different subject that, because each provided a foundation for the development of pathways and future directions, were found to have intersections. The same is true of the research and application talks at the official SME release conference. It's almost a law of science. Put two researchers into a room and, eventually, a joint project will emerge. In describing my reactions to the conference, I'm going to skip many, many details, inviting you, the reader, to check out the Roadmap proper when it's made available online and, until then, to read through Chris Phoenix's live-blogging. A panel consisting of Schafmeister, Randall, Drexler, and Firman (with Von Ehr moderating) from the last section of the first day covered major pathway branches presented in the Roadmap, with all the important points caught by Chris Phoenix's QWERTY mastery. Firman said, "Negative results are a caustic subject... while fusing proteins, sometimes we get two proteins that change each other's properties. And that's a negative result, and doesn't get published. It shouldn't be lost." Given the survey nature of the types of quantum chemical calculations being performed to model tooltip designs that might be used for the purposes of mechanosynthesis (molecular manufacturing or otherwise), Drexler, Freitas, Merkle, and myself spend considerable time diagnosing failure modes and possibly unusable molecular designs, making what might otherwise be "negative results" important additions to our respective design and analysis protocols. Wired readers will note that Thomas Goetz covered this topic ("Dark Data") and some web efforts to make this type of data available in Issue 15.10. I loved the panel’s discussion of replication, long a point of great controversy over concerns and feasibility. Drexler mentioned how his original notion of a "replicator" as proposed in Engines of Creation is obsolete for pragmatic/logistical reasons. But the next comment was from Schafmeister, who, in his research talk, had proposed something that performs a form of replication (yes, that's the experimental chemist making the bold statement); it would be driven externally, but nonetheless something someone could imagine eventually automating. Christian also performed a heroic feat in his talk by presenting his own (admittedly, by him) "science fiction" pathway for applying his own lab research to a far more technically demanding end, something far down the road as part of his larger research vision. Randall, on the use of the Roadmap, said, "The value of the Roadmap will be judged by the number of people who read it and try to use it. Value will increase exponentially if we come back and update it." The nature of nanoscience research is that six months can mean a revolution. I (and a few others at the very first Working Group meeting) had been familiar with structural DNA nanotechnology, mostly from having seen Ned Seeman present something new at every research talk (that is also a feat in the sciences, where a laboratory is producing quick enough to always have results to hand off to the professor in time for the next conference). The Rothemund DNA Origami paper [PDF] was a turning point to many and made a profound statement on the potential of DNA nanotech. I was amazed by it. Drexler's discussions on the possibilities have been and continue to be contagious. William Shih mentioned that his research base changed fundamentally because of DNA Origami, and seeing the complexity of the designs AND the elegance of the experimental studies out of his group at the Roadmap Conference only cemented in my mind just how fast a new idea can be extended into other applications. It would not surprise me if several major advances before the first revision of the Roadmap required major overhauls of large technical sections. At the very least, I hope that scientific progress requires it. A panel consisting of Hall, Maniar, Theis, O'Neill (with Pearl moderating) from the last section of the second day covered applications, with short-term and very long-term visions represented on the panel (again, all caught by Chris Phoenix). For those who don't know him, Josh Hall was the wildcard of the applications panel, both for his far more distant contemplations on technology than otherwise represented at the conference and for his exhaustive historical perspective (he can synthesize quite a bit of tech history and remind us just how little we actually know given the current state of technology and how we perceive it; O'Neill mentioned this as well, see below). Josh is far and away the most enlightening and entertaining after-dinner raconteur I know. As a computer scientist who remembers wheeling around hard drives in his graduate days, Josh knows well the technological revolutions within the semiconductor industry and just how difficult it can be for even industry insiders to gauge the path ahead and its consequences on researchers and consumers. Papu made an interesting point I'd not thought of before. While research labs can push the absolute limits of nanotechnology in pursuit of new materials or devices, manufacturers can only make the products that their facilities, or their outsourcing partner facilities, can make with the equipment they have available. A research lab antenna might represent a five-year leap in the technology, but it can’t make it into today's mobile phone if the fab facility can't churn it out in its modern 6 Sigma manifestation. Nanoscience isn't just about materials, but also new equipment for synthesis and characterization, and the equipment for that is expensive in its first few generations. While it’s perhaps inappropriate to refer to "consumer grade" products as the "dumbed down" version of "research grade" technologies, investors and conspiracy theorists alike can take comfort in knowing that there really is "above-level" technology in laboratories just hoping the company lasts long enough to provide a product in the next cycle. O'Neill said, "To some of my friends, graphite epoxy is just black aluminum." This comment was in regards to how a previous engineering and technician generation sees advances in specific areas relative to their own mindset and not as part of continuing advancements in their fields. It's safe to say that we all love progress, but many fear change. The progress in science parallels that in technology, and the ability to keep up with the state-of-the-art, much less put it into practice as Papu described, is by no means a trivial matter. Just as medical doctors require recertification, scientists must either keep up with technology or simply see their efforts slow relative to every subsequent generation. Part of the benefit of interdisciplinary research is that the expertise in a separate field is provided automatically upon collaboration. Given the time to understand the physics and the cost of equipment nowadays, most researchers are all too happy to pass off major steps in development to someone else. Non-researchers know the feeling. We've all fumbled with a new technology at one point or another, be it a new cell phone or a new (improved?) operating system, deciding to either "learn only the basics" or throw our hands up in disgust. Imagine having your entire profession changed from the ground up or, even worse, having your profession disappear because of technology. Research happening today in nanoscience will serve a disruptive role in virtually all areas of technology and our economy. Entire industries, too. Can you imagine the first catalytic system that effortlessly turns water into hydrogen and oxygen gas? If filling the tank of your jimmied VW ever means turning on your kitchen spigot, will your neighborhood gas station survive selling peanut M&M's and Snapple at ridiculous prices? I'm one of the lucky individuals who makes a living by thinking about what we may be facing in the years ahead. Those of us who follow this professional path have a variety of tools and methods at our disposal, from subjective brainstorming to models and simulations. I tend to follow a middle path, one that tries to give some structure to imagined futures; in much of the work that I do, I rely on scenarios. Recently, the Center for Responsible Nanotechnology undertook a project to develop a variety of scenarios regarding the different ways in which molecular manufacturing might develop. One of the explicit goals of that project was to come up with a broad cross-section of different types of deployment -- and in that task, I think we succeeded. I'd like to offer up a different take on scenarios for this month's newsletter essay, however. With the last scenario project, we used "drivers" -- the various key factors shaping how major outcomes transpired -- consciously intended to reflect different issues around the development of molecular manufacturing. It's also possible, however, to use a set of drivers with broader applicability, teasing out specific scenarios from the general firmament. Such drivers usually describe very high-level cultural, political and/or economic factors, allowing a consistent set of heuristics to be applied to a variety of topics. Recently, I developed a set of scenarios for a project called "Green Tomorrows." While the scenario stories themselves concerned different responses to the growing climate crisis, the drivers I used operated at a more general level -- and could readily be applied to thinking about different potential futures for molecular manufacturing. The two drivers, each with two extremes, combine to give four different images of the kinds of choices we'll face in the coming decade or two. The drivers I chose reflect my personal view that both how we live and how we develop our tools and systems are ultimately political decisions. The first, "Who Makes the Rules? ", covers a spectrum from Centralized to Distributed. Is the locus of authority and decision-making limited to small numbers of powerful leaders, or found more broadly in the choices made by everyday citizens, working both collaboratively and individually? The second, "How Do We Use Technology? ", runs from Precautionary to Proactionary. Do the choices we make with both current and emerging technologies tend to adopt a "look before you leap" or a "he who hesitates is lost" approach? So, how do these combine? The first scenario, living in the combination of Centralized rule-making and Precautionary technology use, is "Care Bears." The name refers to online games in which players are prevented by the game rules from attacking each other. For players who want no controls, the rules are overly-restrictive and remove the element of surprise and innovation; for players who just want an enjoyable experience, the rules are a welcome relief. In this scenario, then, top-down rule-making with an emphasis on prevention of harm comes to slow overall rates of molecular manufacturing progress. The result is a world where nanotechnology-derived solutions are harder to come by, but one where nanotechnology-derived risks are less likely, as well. This is something of a baseline scenario for people who believe that regulation, licensing, and controls on research and development are ultimately good solutions for avoiding disastrous outcomes. The stability of the scenario, however, depends upon both how well the top-down controls work, and whether emerging capabilities of molecular manufacturing tempt some people or states to grab greater power. If this scenario breaks, it could easily push into the lower/right world. The second scenario, combining Centralized rule-making and Proactionary technology use, is "There Once Was A Planet Called Earth..." The name sets out the story fairly concisely: competition between centralized powers seeking to adopt the most powerful technologies as quickly as possible -- whether for benign or malignant reasons -- stands a very strong likelihood of leading to a devastating conflict. For me, this is the scenario most likely to lead to a bad outcome. Mutually-assured global destruction is not the only outcome, but the probable path out of this scenario is a shift towards greater restrictions and controls. This could happen because people see the risks and act accordingly, but is more likely to happen because of an accident or conflict that brings us to the brink of disaster. In such a scenario, increasing restrictions (moving from proactionary to precautionary) are more likely than increasing freedom (moving from centralized to distributed). 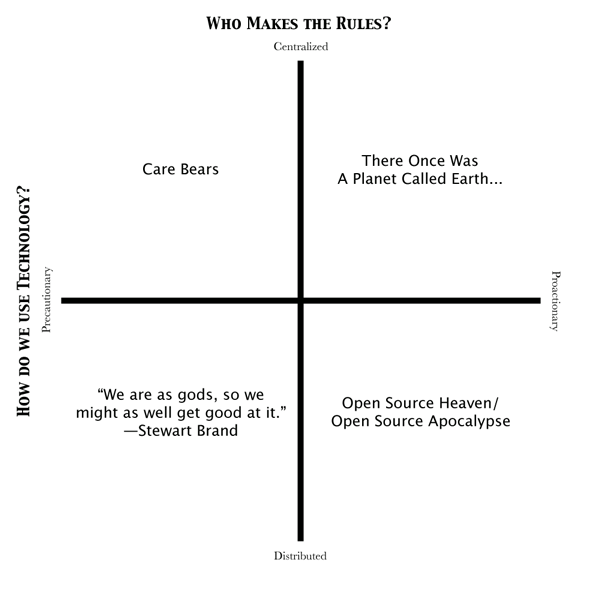 The third scenario, combining Distributed rule-making and Proactionary technology use, is "Open Source Heaven/Open Source Apocalypse." The name reflects the two quite divergent possibilities inherent in this scenario: one where the spread of user knowledge and access to molecular manufacturing technologies actually makes the world safer by giving more people the ability to recognize and respond to accidents and threats, and one where the spread of knowledge and access makes it possible for super-empowered angry individuals to unleash destruction without warning, from anywhere. My own bias is towards the "Open Source Heaven" version, but I recognize the risks that this entails. We wouldn't last long if the knowledge of how to make a device that would blow up the planet with a single button-push became widespread, and some of the arguments around the destructive potential of late-game molecular manufacturing seem to approach that level of threat. Conversely, it's not hard to find evidence that open source knowledge and access tends to offer greater long-term safety and stability than does a closed approach, and that insufficiently-closed projects leaking out to interested and committed malefactors (but not as readily to those who might help to defend against them) offers the risks of opening up without any of the benefits. Finally, the fourth scenario, combining Distributed rule-making and Precautionary technology use, is "We Are As Gods, So We Might As Well Get Good At It." Stewart Brand used that as an opening line for his Whole Earth Catalogs, reflecting his sense that the emerging potential of new technologies and social models gave us -- as human beings -- access to far greater capabilities than ever before, and that our survival depended upon careful, considered examination of the implications of this fact. In this world, the widespread knowledge of and access to molecular manufacturing technologies gives us a chance to deal with some of the more pressing big problems we as a planet face -- extreme poverty, hunger, global warming, and the like -- in effect allowing us breathing room to take stock of what kind of future we'd like to create. Those individuals tempted to use these capabilities for personal aggrandizement have to face a knowledgeable and empowered populace, as do those states seeking to take control away from the citizenry. This is, admittedly, the least likely of the four worlds, sadly. But you don't have to take my word for it. This "four box" structure doesn't offer predictions, but a set of lenses with which to understand possible outcomes and the strategies that might be employed to reach or avoid them. The world that will emerge will undoubtedly have elements of all four scenarios, as different nations and regions are likely to take different paths. The main purpose of this structure is to prompt discussion about what we can do now to push towards the kind of world in which we'd want to live, and to thrive. How soon could molecular manufacturing (MM) arrive? It's an important question, and one that the Center for Responsible Nanotechnology takes seriously. In our recently released series of scenarios for the emergence of molecular manufacturing, we talk about MM appearing by late in the next decade; on the CRN main website, we describe MM as being plausible by as early as 2015. If you follow the broader conversation online and in the technical media about molecular manufacturing, however, you might argue that such timelines are quite aggressive, and not at all the consensus. CRN doesn't talk about the possible emergence of molecular manufacturing by 2015-2020 because we think that this timeline is necessarily the most realistic forecast. Instead, we use that timeline because the purpose of the Center for Responsible Nanotechnology is not prediction, but preparation. While arguably not the most likely outcome, the emergence of molecular manufacturing by 2015 is entirely plausible. A variety of public projects underway today could, with the right results to current production dilemmas, conceivably bring about the first working nanofactory within a decade. Covert projects could do so as well, or even sooner, especially if they've been underway for some time. CRN's leaders do not focus on how soon molecular manufacturing could emerge simply out of an affection for nifty technology, or as an aid to making investment decisions, or to be technology pundits. The CRN timeline has always been in the service of the larger goal of making useful preparations for (and devising effective responses to) the onset of molecular manufacturing, so as to avoid the worst possible outcomes such technology could unleash. We believe that the risks of undesirable results increase if molecular manufacturing emerges as a surprise, with leading nations (or companies, or NGOs) tempted to embrace their first-mover advantage economically, politically, or militarily. Recognizing that this event could plausibly happen in the next decade -- even if the mainstream conclusion is that it's unlikely before 2025 or 2030 -- elicits what we consider to be an appropriate sense of urgency regarding the need to be prepared. Facing a world of molecular manufacturing without adequate forethought is a far, far worse outcome than developing plans and policies for a slow-to-arrive event. There's a larger issue at work here, too, particularly in regards to the scenario project. The further out we push the discussion of the likely arrival of molecular manufacturing, the more difficult it becomes to make any kind of useful observations about the political, environmental, economic, social and especially technological context in which MM could occur. It's much more likely that the world of 2020 will have conditions familiar to those of us in 2007 or 2008 than will the world of 2030 or 2040. Barring what Nassim Nicholas Taleb calls "Black Swans" (radical, transformative surprise developments that are extremely difficult to predict), we can have a reasonable image of the kinds of drivers the people of a decade hence might face. The same simply cannot be said for a world of 20 or 30 years down the road -- there are too many variables and possible surprises. Devising scenarios that operate in the more conservative timeframe would actually reduce their value as planning and preparation tools. Again, this comes down to wanting to prepare for an outcome known to be almost certain in the long term, and impossible to rule out in the near term. CRN's Director of Research Communities Jessica Margolin noted in conversation that this is a familiar concept for those of us who live in earthquake country. We know, in the San Francisco region, that the Hayward Fault is near-certain to unleash a major (7+) earthquake sometime this century. Even though the mainstream geophysicists' view is that such a quake may not be likely to hit for another couple of decades, it could happen tomorrow. Because of this, there are public programs to educate people on what to have on hand, and wise residents of the region have stocked up accordingly. While Bay Area residents go about our lives assuming that the emergency bottled water and the batteries we have stored will expire unused, we know that if that assumption is wrong we'll be extremely relieved to have planned ahead. The same is true for the work of the Center for Responsible Nanotechnology. It may well be that molecular manufacturing remains 20 or 30 years off and that the preparations we make now will eventually "expire." But if it happens sooner -- if it happens "tomorrow," figuratively speaking -- we'll be very glad we started preparing early.